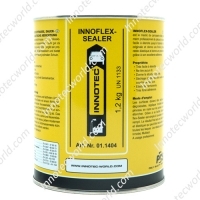 Innoflex-Sealer is a unique brushable bodywork sealant used for sealing bodywork parts with professional results. The product can be brushed to a factory original structure without stringing. During curing, Innoflex-Sealer retains the structure applied to it. It does not spread out, or crack, and shows only minimal shrinkage. The product also has a neutral odour. Innoflex-Sealer retains its elasticity, and thanks to its firm adhesion, offers perfect protection for the surface. Thanks to its fast curing Innoflex-Sealer can be sprayed over after a short time, and the structure applied to the sealant will remain unaffected by the solvent in the paint. The joints on the inside and outside of a vehicle all leave the factory with a brushed sealant. In the event of damage, or for other repair or construction jobs, Innoflex-Sealer is the best product for returning the finish to its original state. The handy 1.2 kg cans make Innoflex-Sealer very economical and easy to use. The special, patented fastening lid ensures that the brush can be easily wiped without the sealant getting on the fastener. This means that the lid can be properly closed, that the product can be kept longer, and that the lid can be easily opened again. For best results it is recommended to use the Nylon Brush. The surface must be clean, dry and free of grease. Clean surfaces with Innotec Multisol. Apply Innoflex-Sealer directly from the tin using a firm nylon brush or spatula. – Very easy to brush. – Fast drying, can be sprayed over quickly.